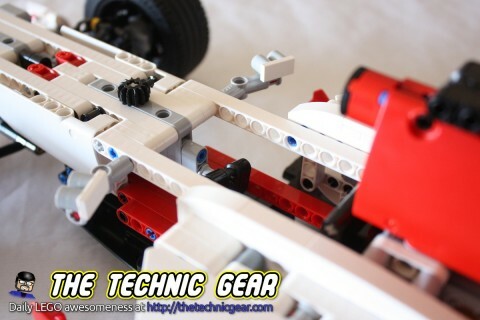 LEGO Technic range of sets is about creating machines that work and move, so what better set that this fantastic F1 Car with dozens of details. I have built quite a few Technic sets already but none left me as satisfied as this Grand Prix Racer. For such an interesting model the instructions is surprisingly short. Just three booklets to build the whole model. The model comes with lots of stickers to decorate it that I haven’t used at all. This model is a real delight to build. I have enjoyed it more than the Unimog or the 4×4 Crawler as you progress really fast through it. The lovely way the steering wheel works, the suspension, the spoilers, the incredible (and fake) V8 motor, the four new fantastic wheels… all in this model is so lovely. 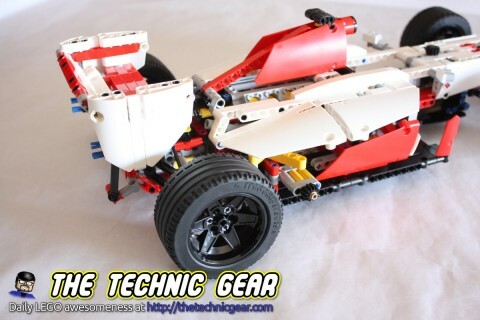 Although the car doesn’t move at all ( unless you move it with your hands ) it is really awesome how it is build. You can steer the wheels either by moving the steering wheel or by using a special gear placed on the top of the car for that task. 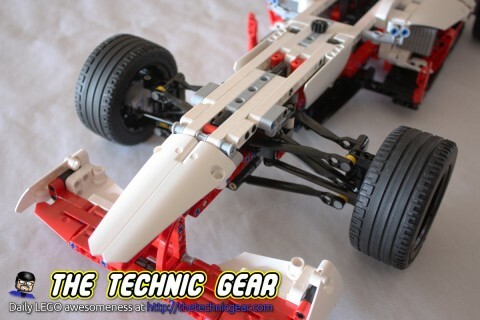 You can raise the cover that contains the V8 motor using linear actuators ( two of them ) or change the selector and move the tiling spoiler on the back of the car. 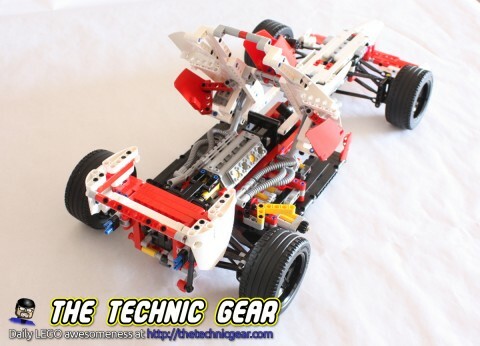 Both front and back axles has differential gears to allow the car a great turning distance. Watch this video for the timelapse building of the model. This is the complete car. Here you have the main features in this short two minutes video. There are so many parts that really deserves a mentions that it is hard to start writing. First the front part of the car features a greatly detailed F1 car’s frontal flaps. The wheels and suspension is incredible solid and stable, you can push the car in a straight line and it won’t turn at all. You can’t imagine how hard was to take it apart when I had to do it. The fact that the steering wheel moves when the car steers is something that really won my heart. Just after the seat the model hides a moving-piston fake V8 engine that can be seen at its full glory because the car features two linear actuators for lifting a cover over it. Finally the rear spoilers on the back of the car can be adjusted for obtaining the best turn performance, or just for aesthetics… as it is the case. I love F1. I really enjoy watching those endless racing cars doing one turn after another. So this model already had my heart won, but when building it, I have enjoyed so much that I can’t but to recommend it to you. Lovely model. Maybe it is the model I have enjoyed more building it. Lots of parts, specially many of them suitable for car building like differential gears. Miguel – part of the FUN is figuring out how to integrate a battery, IR receiver, steering motor and drive motor(s)! With most of the new sets, LEGO’s done a good job of balancing cost (thus, price) with design – they make it possible (sometimes, nowhere near easy – but possible) to “max them out” but don’t limit the set’s sales by adding all of those components to the “basic set”.